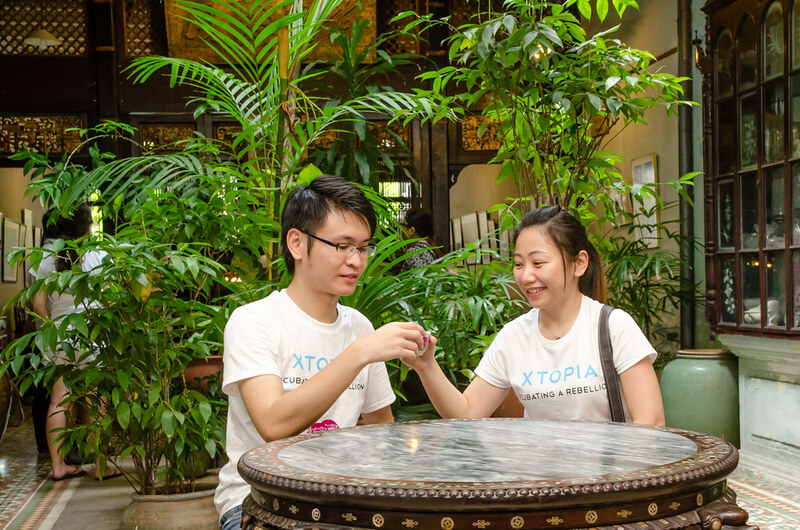 Sun Yat-sen Museum is our next destination after enjoying our coconut ice-cream at Busy Bodhi Cafe. 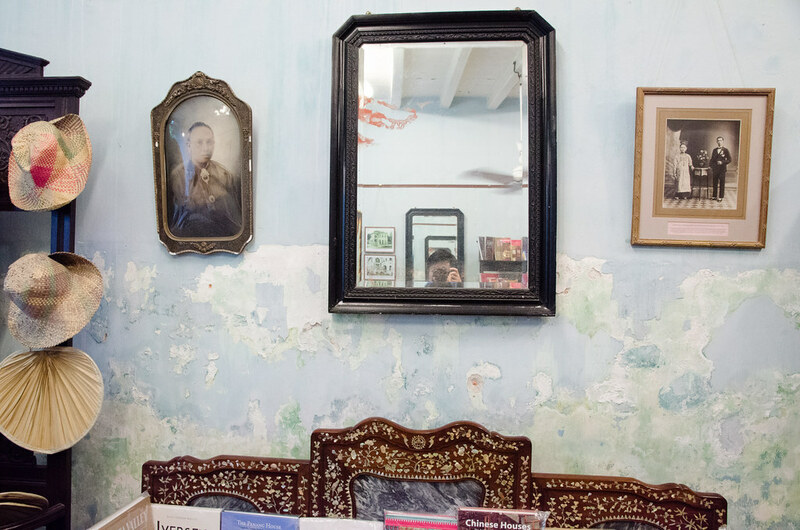 Penang is not all about food and more food. 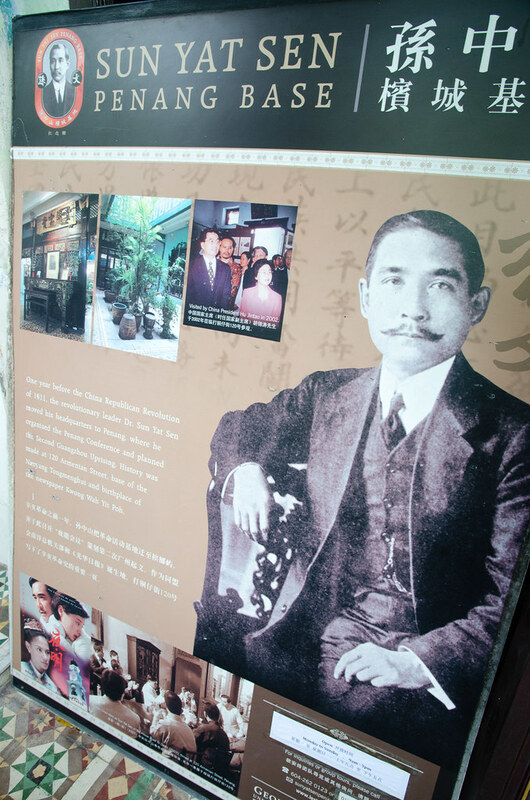 There are interesting historical places to visit such as this Sun Yat-sen Museum (formerly named as Sun Yat-sen Penang Base) at Georgetown and previously blogged, Leong San Tong Khoo Kongsi (邱公司) Temple. According to Wikipedia, Sun Yat-sen is a Chinese revolutionary, first president and founding father of the Republic of China, and a medical practitioner. 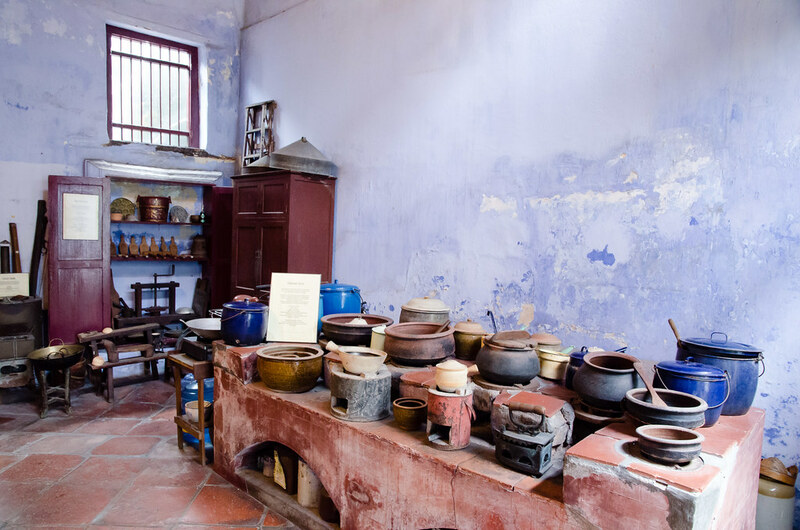 Sun Yat-sen Museum Penang is an old classic house where Sun Yat-sen planned many ways to overthrow Qing Dynasty including the uprising of the China Revolution of 1911. 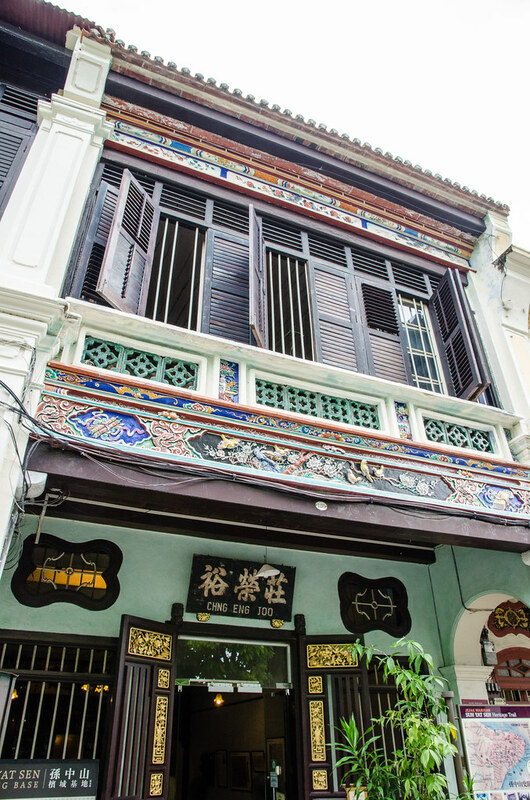 Sun Yat-sen Museum is a classic Penang house. In front of the Sun Yat-sen Museum which is a well-maintained residential townhouse built in year 1880. Look at those colourful and detailed carving. A poster explaining the museum which is formerly known as Sun Yat-sen Penang Base. As you can see here, the museum was one of the location for the movie Road To Dawn. Laupoh signing the guess book for us. 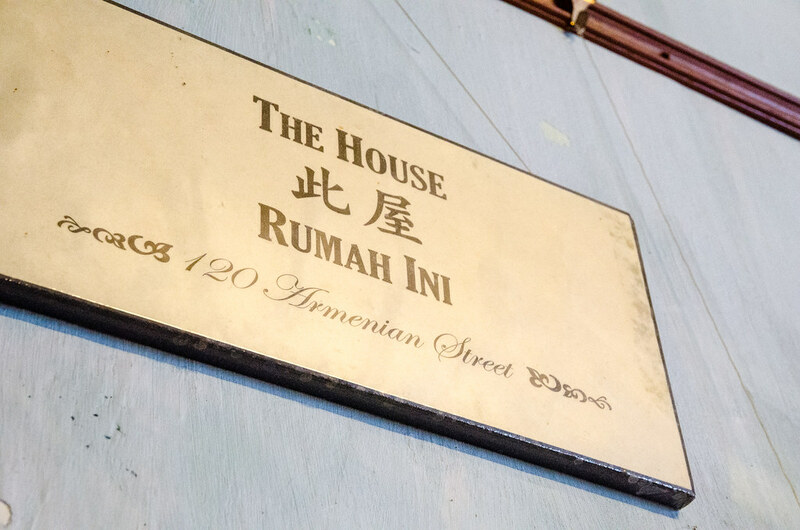 The entrance fee is RM 5 including an in-house guided tour and tea. The fee is RM 3 if you are a student. The leng zhai here is Kenny Wong, who will share the history of this place with his brother, Alvin Wong. You can request the tour to be in English, Malay, Mandarin and Thai (by prior arrangement). 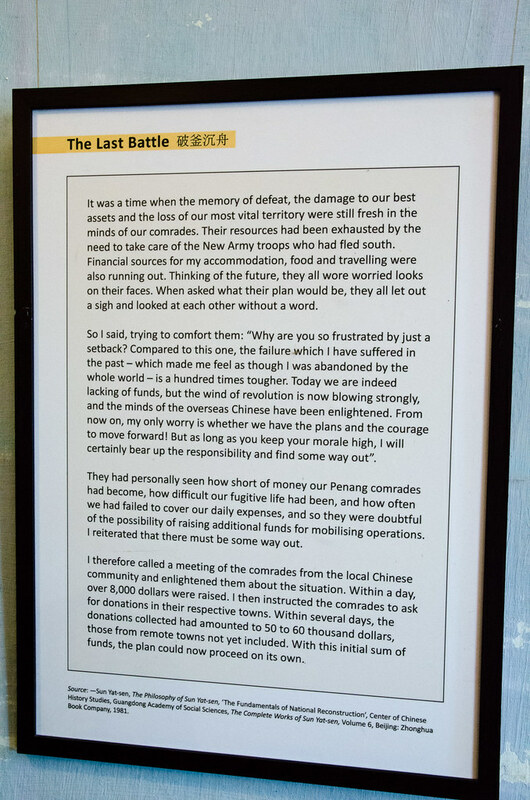 In this museum, you will learn a lot about Dr. Sun Yat-sen, for example this history of The Last Battle. 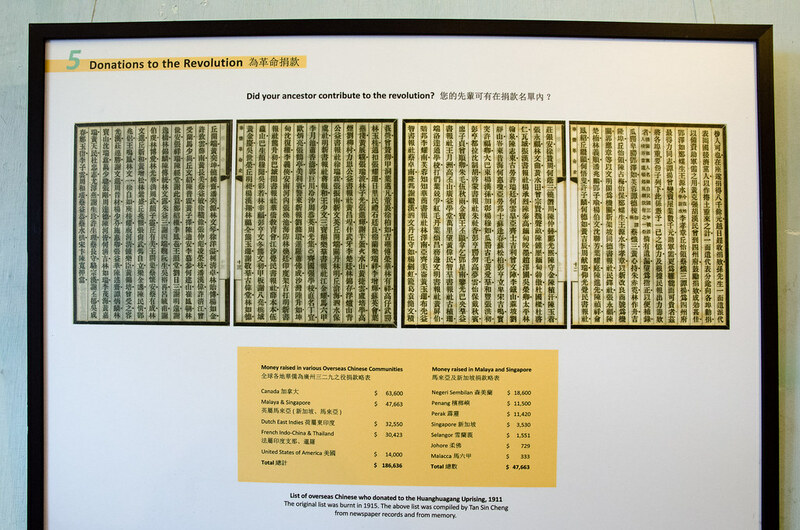 Another historical item here is this list of overseas Chinese who donated to the Huanghuagang Uprising, 1911. But this one is not the original list as it was burnt in 1915. This list is compiled from Tan Sin Cheng’s memory and newspaper records. 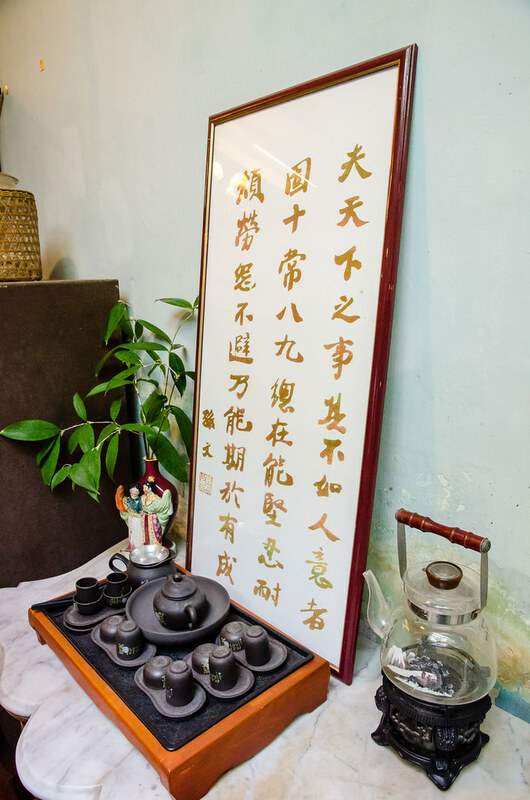 Chinese writing in the Sun Yat-sen Museum with classic tea pot set. Not really sure what it is about as I can’t read Mandarin. 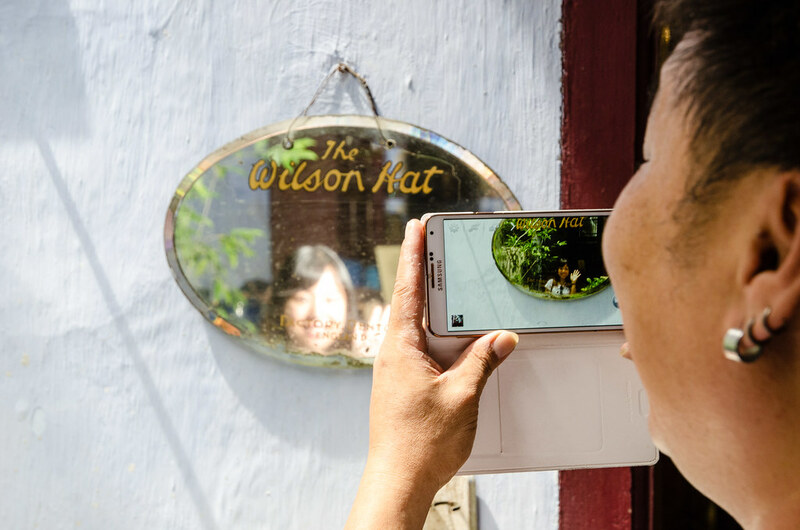 The photo on the left here is Madam Tan Ean Siew, who was the matriarch of this house from year 1926 to 1993. You can read more about her here. 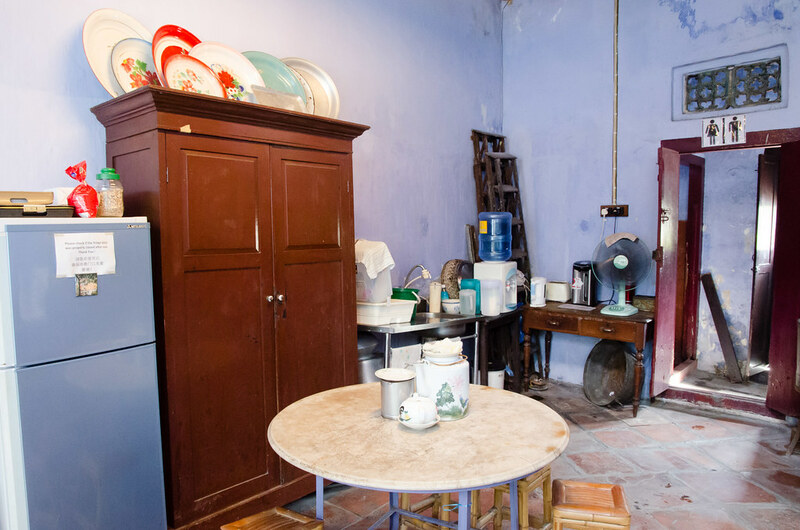 Nyonya style firewood kitchen and utensils are well kept here. You can play cooking with it and shoot photo for memories. The kitchen space is very big indeed with natural light from the opening in the ceiling. An old style cupboard beside a fridge. 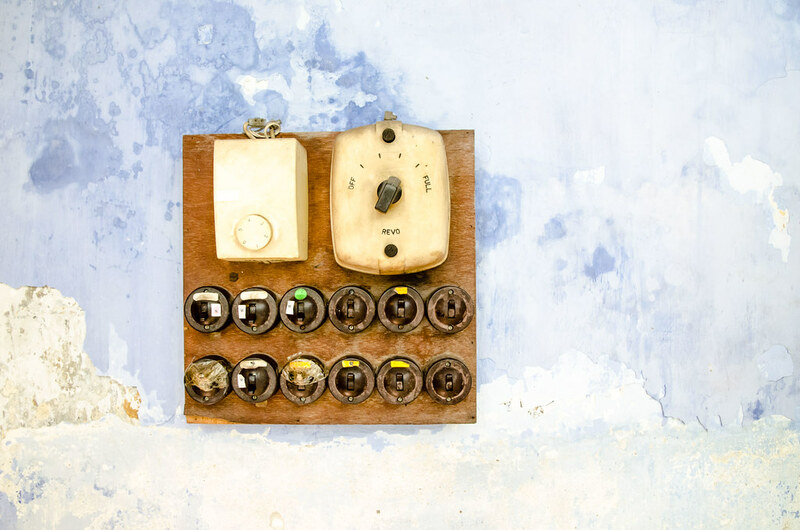 Very old style power switches and fan control from many years ago. 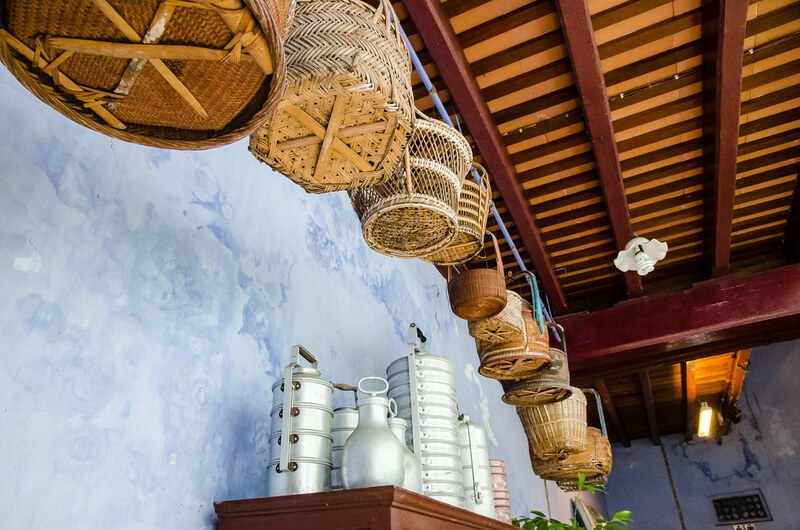 More Nyonya style utensils and baskets. The wooden ceiling here looks interesting, like kuih lapis. A spiral staircase. According to Kenny, this is where Dr. Sun Yat Sen has his wedding photo taken. 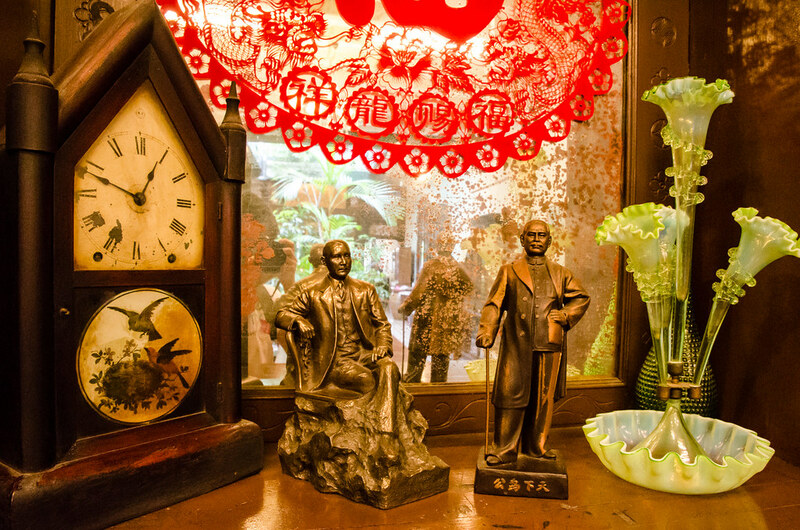 A really old clock and figurines of Dr. Sun Yat Sen. Couple photo taken by Kenny in the museum. He is very good at teaching us how to pose at those unique spots in the museum. Kenny is our tour guide and also our photographer in the museum. This is one the popular spot for shooting photo. Kenny will happily show you all the photography spot in the museum including how to pose on those spot. 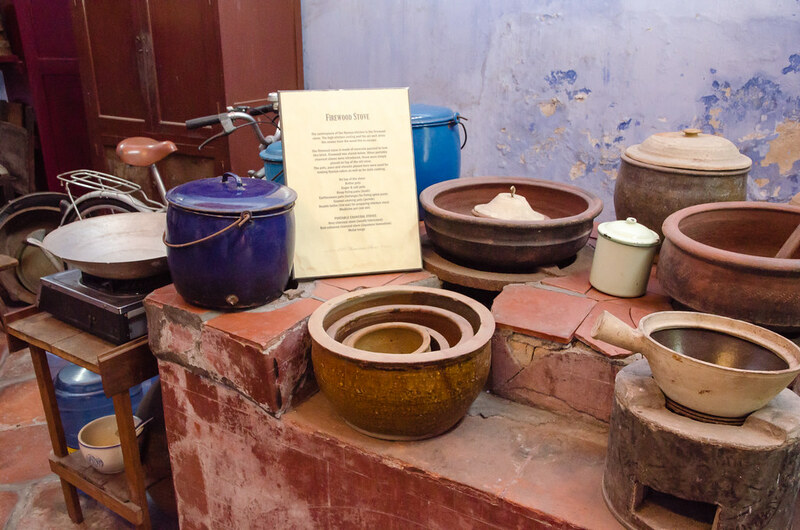 A closer look on the Nyonya cooking utensils. 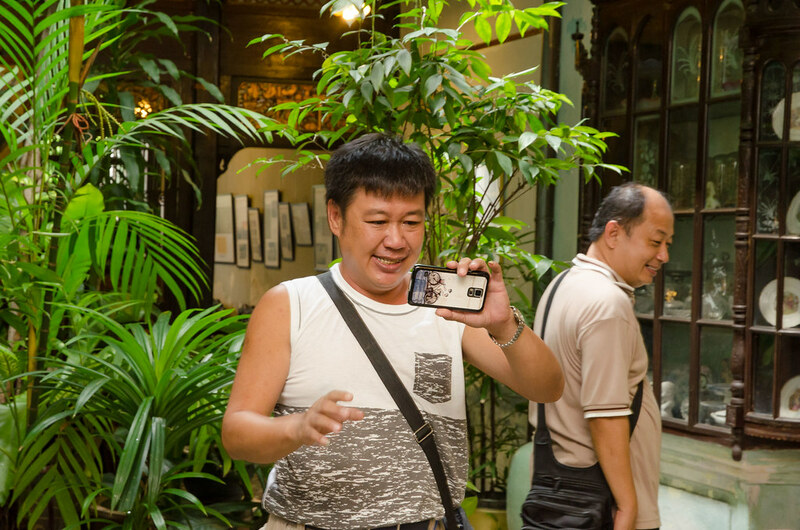 You can touch them and pretending cooking yourself a Nyonya meal and take some photos. The house has interesting opening in the ceiling that allow natural light to come into the house, and also rainwater for the plant. If you are in the mood, I guess you can play in the rain in the house as well? 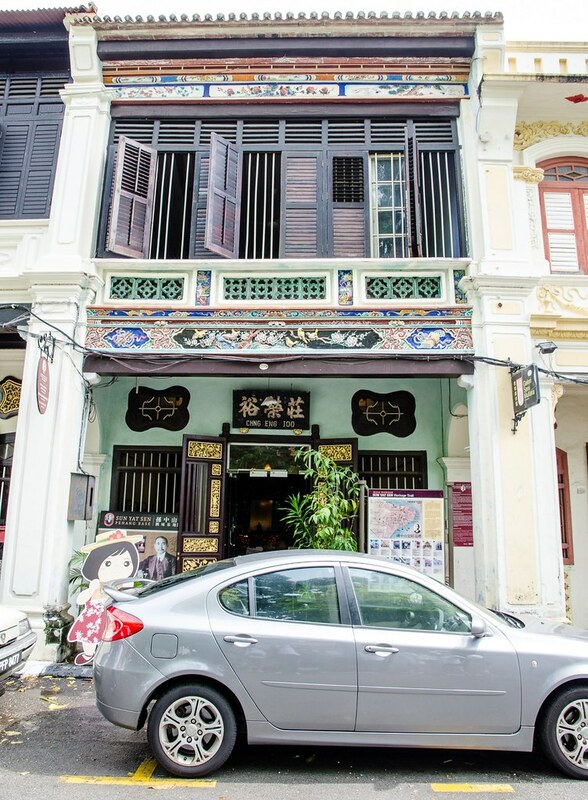 Sun Yat-sen Museum is located on Armenian Street which has many historical places to visit. 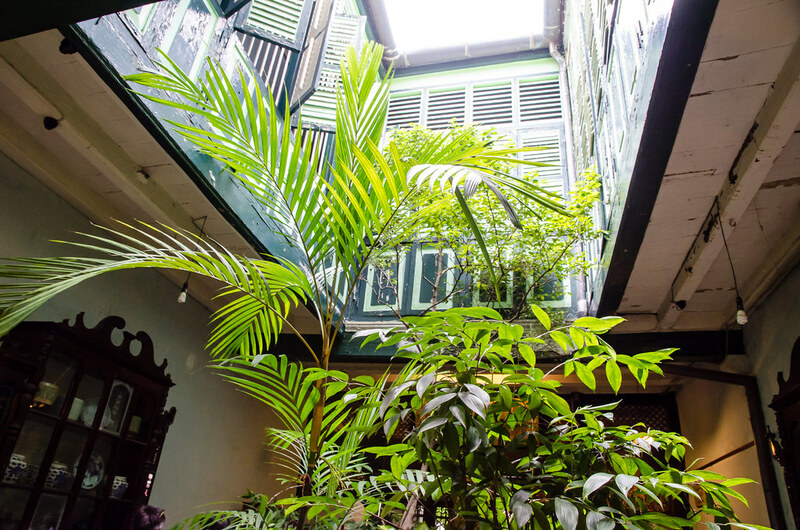 Another photo of this awesome and well-maintained townhouse that is converted to a musuem. 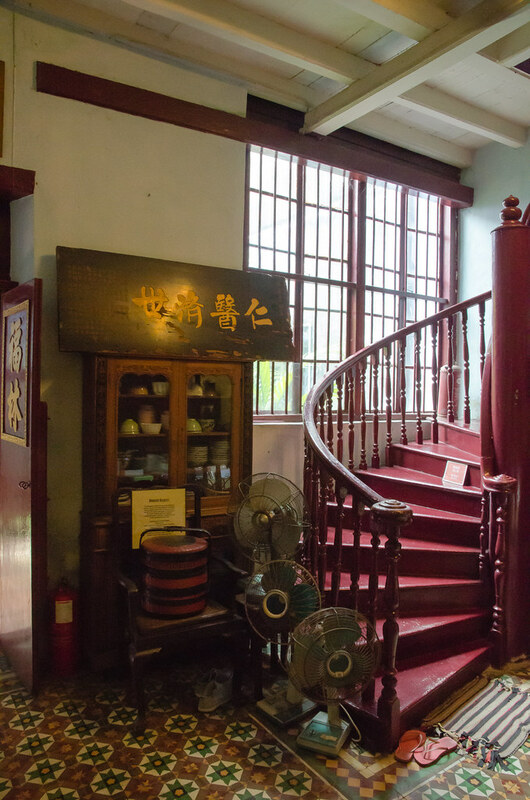 If you are interested in the history or classic stuff, do pay a visit to Sun Yat-Sen Museum. Be sure to get Kenny for photography ideas around the house. Nice! I came here a couple of years back. 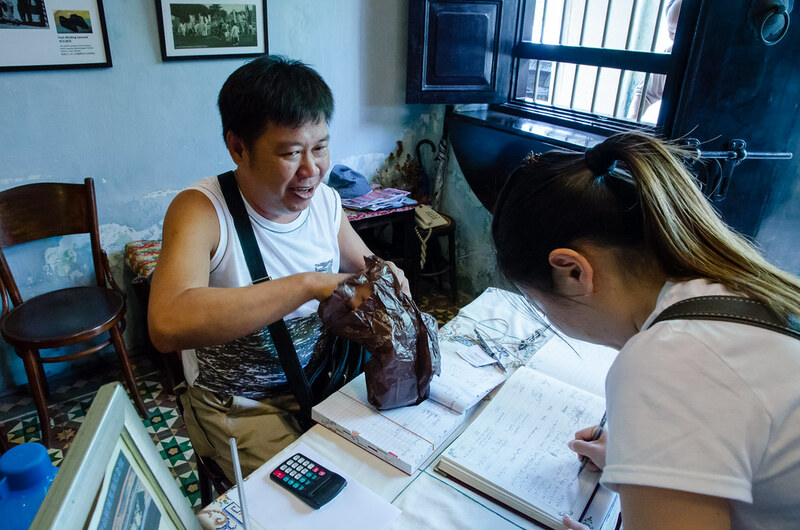 I was trying to do a trip for under RM 1,000 and managed to do just that and also catch all the sights of Penang (including Sun Yat Sen museum), eat all the food we wanted (like the Sup Hameed in front of Cititel) and the hotels all paid for too. Granted, I had a friend there though, so transport was easy, even to Ayer Itam. Sup Hameed looks nice, must try the next time we go Penang.